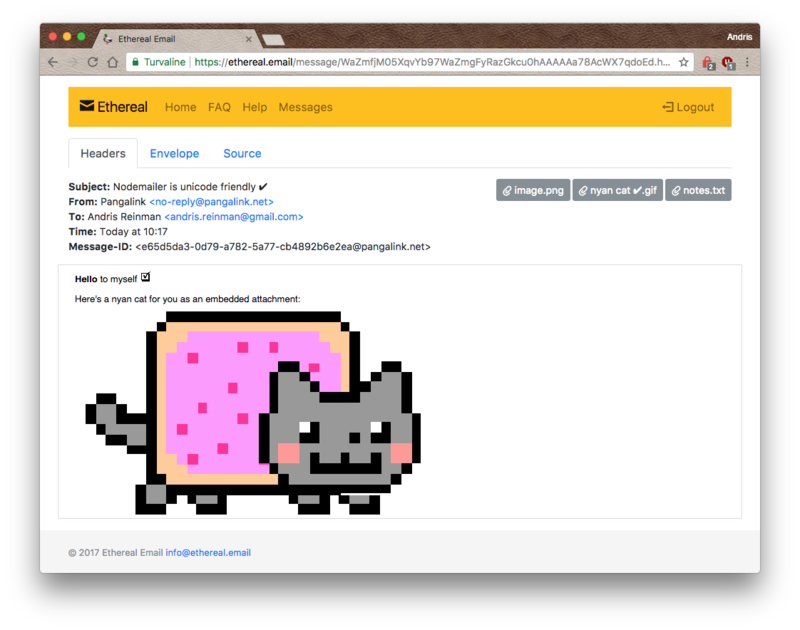 Nodemailer is a module for Node.js applications to allow easy as cake email sending. The project got started back in 2010 when there was no sane option to send email messages, today it is the solution most Node.js users turn to by default. Nodemailer is licensed under MIT license. See license details in the License page. If you are upgrading from Nodemailer v2 or older, then see the light migration guide here. You can support Nodemailer by becoming either an OpenCollective sponsor, a patreon or by making a donation via PayPal, see License page for details. Node.js v6.0.0 or newer. That’s it. If you are able to run Node.js version 6 or newer, then you can use Nodemailer. There are no platform or resource specific requirements. All public Nodemailer methods support both callbacks and Promises (if callback is omitted). You need to have at least Node v8.0.0 if you want to use async..await with Nodemailer. Nodemailer AMQP example is an example of using RabbitMQ to manage Nodemailer email messages. Source. Nodemailer source can be found from Github. Nodemailer is created by Andris Reinman. The Nodemailer logo was designed by Sven Kristjansen.